I seriously think the Bridal Registry industry is missing out by not advocating sets of dishes just for knitting. Though technically, you don't need a whole set as such. Cool plaids or colourful solids from thrift and antique stores do a great job in any quantity. 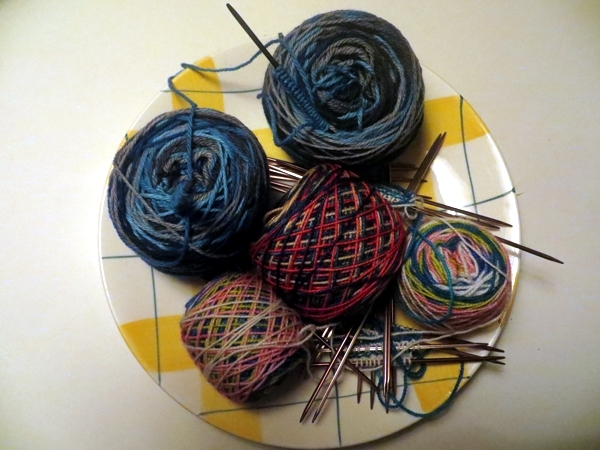 Okay, maybe I'm more alone than I think, using a plate as a staging area for knitting that's coming up in the queue or getting worked on intermittently. But it really is a great way to corral knitting that isn't ready for a bag or basket. 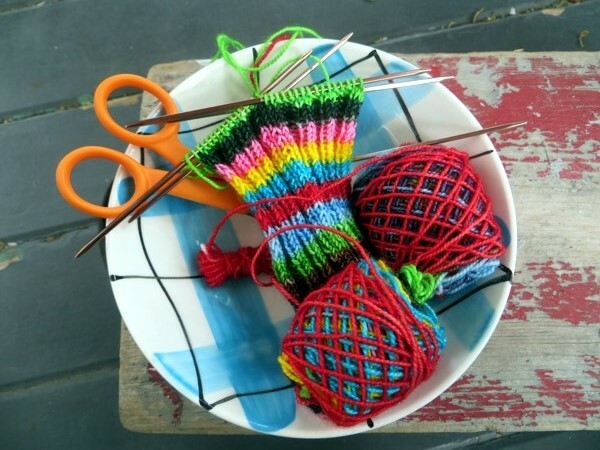 Porcelain and china have fewer pointy bits to catch your yarn than a basket, too. But usually there's just one or two things on there, looking inviting, being handy for a dash downstairs to the TV where a movie is playing, or for a trip to the porch, or into a little bag for my purse when what was in there gets too close to done to be worth taking out of the house. 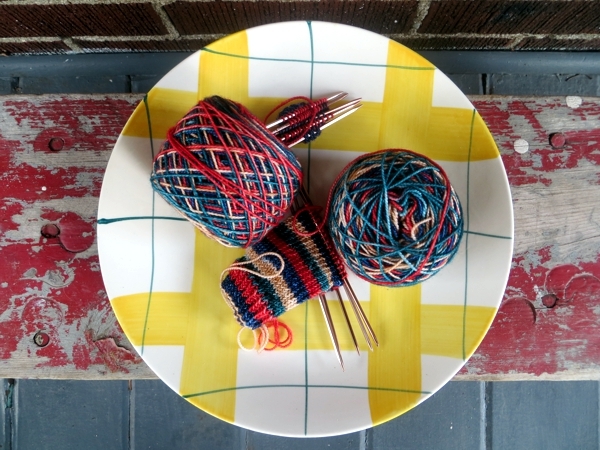 Of course, there's more to knitting dishes than plates. Really pretty bowls, for example. Where do you keep your knitting when it's not in a bag or a basket or on the table in front of your knitting chair? I have to keep my knitting in a bag because my calico cat has decided that eating yarn is the next best thing to eating her cat food...and the other one is crazy about needles...so everything in its place or I regret it in the morning! The rest of it--the balls that want to be something but I don't know what yet? On a table in my studio that is totally overflowing right now...can't wait until we get back from London and can tackle all that stuff!